I’m seeing a disturbing trend in the pet dog world. Something I never thought I would see. I truly wish I did not have to write this blog post. Unfortunately I can no longer sit back and watch what is happening without voicing my concerns, and doing what I can to prevent injuries and deaths to dogs and people. This information may seem over-the-top and dramatic, but it’s what I see in my line of work every week. Tyler Muto is a dog trainer located in Buffalo New York, who is a friend of mine. In my opinion he is one of the best dog trainers in North America at rehabilitating reactive and aggressive dogs. He is someone I have looked up to for many years in the dog training world. His business is absolutely thriving, he has five full-time dog trainers working for him, does plenty of boarding and grooming, and does seminars around the country. Recently while on a radio show, he described something very negative that is happening to dogs in his area. Several local animal shelters in his area have taken measures to try and hurt his business. I’m not worried about his business as he’s extremely busy and amazing at what he does. I am however worried about the local dogs in his area that need homes. Several shelters in his area have taken it upon themselves, to not allow dogs to be adopted if they think the dogs will be trained by Tyler and his company when they are put into a home. Now to me this is wrong on so many different levels it blows my mind. The most alarming part of this is that they have actually taken it one step further. They are no longer allowing dogs to be adopted into homes if they think that the dogs will go to see a veterinarian that refers business to Tyler. Upon hearing this information I was not really shocked because realistically it happens here in Nova Scotia every day as well as in PEI. Not to mention in every major city in North America. Below is a photo that was taken from in side the PEI humane Society. The dog training world is so massively divided that any type of pressure or correction in training a dog it is absolutely seen as abusive. Dogs are denied homes across North America because they could potentially see a trainer that may or may not utilize correction in his or her’s dog training program. Considering we have far too many dogs in NY and NS sitting in shelters and rescue organizations including foster homes who need homes, this seems to be a very negative thing for the dogs who need homes. Millions of dogs in the USA and Canada are killed every year because of lack of space in shelters. When did we as a society become so against correction, that we will allow dogs to live in a small enclosure, or killed, rather than to be trained by qualified professional trainers who are more than able to fix these dogs behavioural problems and aggression issues. I see nothing other than ego in people making decisions like this based on emotion and ignorance. I have people calling me wanting to sign up to training whether it be obedience training, aggression rehab, or puppy training, and when I ask where they are adopting a dog from, I have to tell them that unfortunately you cannot work with me because some shelters will deny your application will be denied. Again I have no issue with this affecting Tyler’s business or even my own business. Do what they wish to try to effect our business, but both Tyler and I are very passionate about helping dogs, and especially dogs with behavioural issues or aggressive issues. Considering we rehabilitate more reactive and aggressive dogs than anyone else in Nova Scotia, you would think that these policy makers would be making it easier, not harder if they honestly had the dogs best interest at heart. It’s really very sickening that dogs are sitting in shelters at this very moment, denied adoption because of ones choice in Veterinarians, or dog trainers. Ego is a terrible thing when it overtakes a person who holds power to make change for dogs. Tyler and I have hundreds of amazing life changing testimonials and videos to prove how we positively change dogs lives everyday. Not to mentions thousands of happy clients and dogs. My stomach is seriously sick. Recently a friend of mine called me from a local shelter and wanted to set up some puppy training because they were adopting a puppy and the shelter makes it mandatory for some dogs to have training by an approved (pure positive only) trainer. Unfortunately I had to tell them not to use my name as I am not in the good books with that shelter without reason. They were incredibly furious over the situation reluctantly signed up to another trainers program because of intimidation. They almost did not adopt the puppy because they were outraged. What makes that situation so disturbing is that my puppy programs are food/marker training based programs. The situation gets more interesting, as several of the employees and staff of that shelter are my clients who have not told management for fear of being let go. Several months ago I had a lady and her husband come into my facility for an evaluation. As the lady was walking down my driveway her dog was so bad on the leash she actually pulled the lady over upon entering my facility and she fell on her hands and knees and dropped the leash. After her husband lovingly helped to pick her up it was brought to my attention that she was five months pregnant. I asked the couple when they had last walked the dog, they replied “months ago, the last time I walked her she pulled the leash out of my hand, attacked another dog and in the process pulled me down to the ground.” Realizing the severity of the situation I asked her how she would feel about using a prong collar on her dog. If you’re not familiar with the prong collar is a collar that mimics the bite of a mother dog and can be an amazing tool for dogs with pulling issues. She told me that she works at a local shelter and she would not be willing to use a prong collar on her dog for any reason because she was concerned about what the other staff would say. I asked her if she had tried other techniques or tools. She told me that she had tried many other tools with very limited results. She told me she was not willing to use a gentle leader on her dog because she felt that her dog did not like walking with it on. I asked her if she would be willing to give me five minutes of her time with the dog. She and her husband were reluctant to allow me to use a pinch collar on their dog. They agreed. Within five minutes I was able to walk their dog with two fingers on the leash and no pulling issues. (With no corrections by the way.) I handed the leash over to the husband first and he remarked how amazingly effective the tool was, how the dog was still happy and how the dog was not being hurt in the process. The wife was next she was also able to walk the dog without an issue. She was less enthusiastic. Upon returning to the facility I suggested using this tool for leash walking because I was concerned about the safety of the unborn baby that she was carrying. I asked her a very pointed question. ” Was your dog harmed in the last five minutes that we did the leash walking with the pinch collar? ” She said “no”. I asked her why she was reluctant if that was the case. Her honesty astounded me. She was reluctant because for two reasons: 1: She didn’t want the other shelter staff to find out. 2: She thought a normal buckle collar would be the most loving tool to use for walking her dog. I looked both of them in the eyes and told them that they were putting the life of their unborn child in jeopardy because of their egos. They walked out of my facility never to be heard from again. About a year ago I was walking in a local park with my dogs off leash. I met a lady with a young golden retriever puppy who was nine months old at the time. As we were walking down the path together with our dogs she ran towards her dog and started yelling “no no no no no!” She got a hold of her dog and pulled something out of her dog’s mouth. She then let her dog go off leash once again as she began to tell me about some of the troubles she was having with this dog. At nine months of age this dog had already had two very dangerous surgeries to extract large objects from the dogs stomach. Each surgery cost her $3000. I suggested to her that she prevent this from happening again or utilize some training to stop her dog from eating objects while on walks. Unfortunately she shrugged off the advice like she knew better than me. Her next comment absolutely astounded me. ” It only happens once every few months” She said. I told her that I was not in anyway concerned over the fact that she already paid $6000 to get objects taken out of her dog stomach. I was however concerned that her dog could have died in the process because such surgeries are extremely dangerous and anytime a dog is put under the knife it has a chance of not waking up. Again she shrugged off the information like she knew better than me. She said she was not interested in putting the time into training, so I suggested that she keep her dog on a leash so that that would not happen again. Again she brushed off my advice. The above stories may seem a little extreme. Unfortunately as I reflect, I have countless stories just like these. People are deciding that the freedom of a dog to do whatever it wants is more beneficial than the safety of a dog’s life or a persons life. This is not a reflection on the Pure Positive trainers. Please don’t see it as an attack on them because it absolutely is not. It is however a wake up call for those people unwilling to restrict the freedom of a dog to save it’s life. The safety of an unborn child Is being put in jeopardy because of a parents ego. And dogs are sitting in shelters without homes this Christmas because potential adopters could potentially use a trainer or veterinarian that a person in a position of power does not agree with. May someone reading this blog advocate for family safety, a dogs safety and the dogs waiting for homes across North America. Check out our Family of Unleashed Potential Dog Trainers life changing videos on YouTube by clicking HERE. As an animal lover, shelter volunteer and strong advocate for responsible pet guardianship I have spent years reading/researching volumes of books and methods. In theory the purely positive methods set the standard in ideals, but in the real world with real problems/real people most never come close to achieving the relationship they desire with their dog using PP training techniques. 12 – 15 months ago I came across Jeff Gelman’s website and watched almost all of the 260 video’s he has available and was astonished with all he is able to accomplish. His explanation of the proper use of the recommended Herm Sprenger prong collar was wonderful. I purchased one for by black lab mix who consistently pulled on his flat collar while walking and my walking problems were over. He self corrected his walking behavior while only putting minimal tension on the end of the leash and I have never had pull to “snap” a correction. Since that time walks are wonderful. I am now enrolled in Duke’s Genesis Training program; I have watched the video’s on puppy training and I am 2/3 through the core and have not once encountered anything objectionable or even questionable. If saying NO to your dog is considered cruel and inappropriate, then it is no wonder we have so many problems with dogs and people. It is my hope to learn all Duke has to teach, make it work for me and my dogs and then be able to help members of my community to build better relationships with there dogs and hopefully reduce the number showing up at our local shelter. I think this topic is very interesting, since it’s obviously pressure from the uninformed public, that causes these rescue organizations to set such restrictions. My favorite comment I ever received for using a prong collar, was from a lady walking (read being dragged by) her own dog on a choke chain…. calling the prong collar cruel. It takes all kinds doesn’t it? HYJ Thanks for your comment. by reading the posts It is obvious to me you don’t truly understand what exactly we do and how we do it, so your perception is not really accurate. This is fine, I don’t expect you to understand as you don’t know us at all nor do you understand all aspects on what can be achieved with balance in applying tools to motivate attention. Just to make clear a few things. We teach all behaviours with food, treats, toys and affection with a clear marker system. Behaviours are not taught with an e collar. The e collar is added in to the equation to help reinforce a behaviour and gain attention in distractions. The tool properly conditioned is effective because its motivational and can be used more gentle than a vibration. Our training is done in a positive, humane, non personal, non fearful, non intimidatig manner. Dogs trained in our system are excited to train and get equipment on because they see it as fun, food, freedom. Thanks again for your opinion, since you don’t want to continue the conversation any further I respect that so please don’t. It is not my intent to get a last word in I just want to add a little clarity. I agree to disagree. If you would like to know more about what we do and how we train your welcome to sign up for the Free videos on the home page on the website. you can get a better insight on the Core foundation on how we train. The Free videos will give you a better insight. HYJ that is the biggest misconception of the E collar. It is thought of as a torture device when in fact it is more like a tap on the shoulder. When used properly they are used on such low settings most times the owners can not feel it themselves. It is just a clear communication to the dog on what we are asking. The crazy part is it IS easy! They understand right away! not because it hurts….because it works! IF a correction is used it may feel uncomfortable but much more comfortable than constant stress,a dog fight, or worse yet….DEATH! It allows dogs who once found other dogs, people, park sect stressful and allows them to RUNa no PLAY and be a dog! Yesterday I was looking for new batteries on the Unleashed Potential site for my collar and remote, they have been dying for weeks now and I haven’t bothered to change them because my dog rarely needs to use it anymore. When I was on the site, I came across my testimonial I wrote when I went through training with Ted, it’s on page 8 and was written when Rolo was 5. He’s 8.5 now and this training saved my dog and greatly enhanced his quality of life. My dog is still happy, still wears his collar regularly in case we end up in a situation where someone else’s dog is not being controlled, and is now able to go so many places we were never able to take him. I have recommended Ted to many people who have needed a helping hand, his methods work because he is adaptable, open minded and willing to work with your needs, your family’s needs and your dog’s needs. I wish I had learned of them before 5 years went by. Rolo is 5 years old and all things chocolate labs are supposed to be; hyper, fun, goofy, lovable, etc. But, he was also stubborn and unruly. We had tried puppy obedience classes when he was small, he pulled so badly we couldn’t get him into the classroom and inside, he was too distracted to learn anything. The classes didn’t seem to help at all and to be honest, I’m not sure we “passed” them. We had a private trainer in two different times over the years, we learned basic obedience, but Rolo was dominant and stubborn, it took him weeks to give in to the down command. I tried books, videos and searched the internet for help. 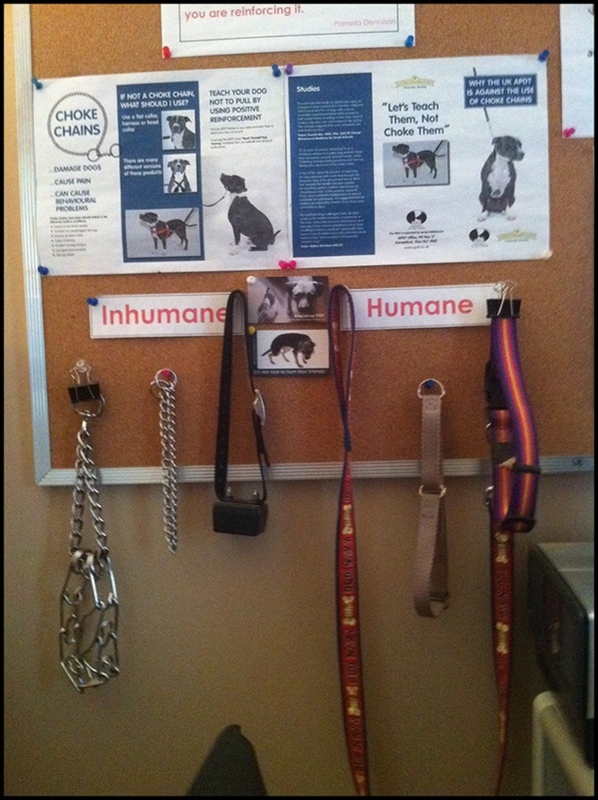 We had different collars, leashes, halties and harnesses. Over the years, we’ve adapted our lives around Rolo’s issues. Moving across the street away from other people and dogs while walking, not taking him to places like the lake or the park, keeping him fenced in the yard because he’d run as soon as he’d realize he wasn’t leashed, and putting him outside or in another room when company came because he’d jump all over them. It was embarrassing to have people in, it was embarrassing to take him out. The last straw came when we had to take him to the vet and his behavior landed us in a private room away from everyone else. I was feeling desperate to have some control over my life and this dog, and found Ted from Unleashed Potential during one of my internet searches. Ted came to the house and gave a demonstration, explained his methods and left all the information I needed. At first, I was very skeptical, I had tried a lot of things so far and wasn’t convinced this was going to work. But, after talking to Ted some more, I decided to go ahead, and the results have been amazing. Rolo now plays in the front yard while I shovel snow without a fence! He’s been skating with us for the first time and never once wandered off, not even when two large dogs showed up. He has been learning to greet people without scaring them, and has advanced enough to take him off leash in Point Pleasant Park. We still have a lot to learn, but I’m confident we can master it. We even made it to the vet without being removed from the waiting room!! Ted from unleashed potential K9 is awesome, he understands what each dog needs, he’s available whenever you need him and is always encouraging. I have never felt embarrassed over my dogs behavior with Ted and am impressed on how quickly the results were seen with his direction and support. I’m really looking forward to summer, cottages, lakes and beaches, Rolo is loving his new freedom!! EASY? The last thing I cared about was EASY and I resent the implication that balance is about easy. Was it easy for Tanner to be stressed out all the time? Easy for him to constantly be on guard? Easy for him to perceive everyone and everything as a threat? In my opinion purely positive trainers who work with reactive dogs are the ones who are abisive. How can you subject your dog to those high levels if stress day in and day ouy? I don’t use an ecollar but one was used to reach him. I use a prong collar. Always. It is much kinder than me bracing myself for the attack. I can walk by dogs and people. I do not have to correct him. He understands. It is not acceptable. He has choices. I couldn’t get within 39 feet of another dog when I was using PP training. I can say no to him. It is NOT negotiable. And YES my dog is happier. He understands the are not a threat. He understands that walking by another dog does not mean he has to defend himself. It’s not science based. It’s common sense based. I wonder what all the pure positive folks think of B.F. Skinner and his 4 quadrant learning theory. Given that no one has ever disproved Skinner, and there is no scientific basis (only an emotional basis,) for R+ I just can’t fathom where these folks are coming from. Of course corrective techniques work! If I got an electric shock around my neck or felt a pinch around my throat every time I reached for a chocolate bar, of course I would stop reaching out. But what kind of a relationship do you want with you dog? With your child? Of course you are both happy when you are playing and cuddling together.. but what about the instances when you DO administer that shock? That jab in the throat? Does it may you feel good to be causing your friend or “family member” something negative and uncomfortable? A push of a button is an easy and fast approach to get the results you want. But sadly, like many things in our developed world, people want the “EASY and QUICK FIX”. Sure, hit the button and they will stop. Pull on the chain a tiny bit, and they won’t pull. Yes, it works, but think of what it’s doing for the dog – mentally and physically. The small doses of pain or discomfort adds up.. and before you know it, many problems can arise. Don’t believe me? Check out some scientific research papers, written by leading canine behaviourists. Don’t get me wrong, some do say to use corrective techniques in severe cases.. but they all say the same thing. There are detrimental LONG TERM effects to this type of training – newly developed problematic behaviours such as aggression, stress, etc. Do a quick Google scholar search. Be informed and educate yourself. Look at the pros and cons. What kind of relationship do you want with your canine companion? Do you want to provide them with a negative experience? Or a positive one? Do you justify your techniques by saying “oh, but it’s just a small shock, just a small tug, it won’t hurt them”? Finally – think critically about the situation. Can you supply your dog with the lifestyle it needs? Of course your German Shepard or Greyhound will be at a higher risk of developing behavioural problems if they are not able to express their normal behaviours. Of course you are putting yourself at risk if you are elderly and have a Pitbull who needs exercise multiple times a day. BE AWARE of not only your dog, but yourself. At the end of the day.. do you want to put in the time and effort so your dog can live a good, healthy and positive life? Or are you just looking for a quick fix like many things in life? This is what education is all about! Saving dog’S life, Teaching people about different tools AND how to use them. Unleashed Potential are about results, truths and helping people AND their dogs! GREAT message and Inspiration to Alot of Balanced dog trainers like myself, Congrats!! and Keep up the good work! All of these balanced trainers must be stopped. They must be stopped from helping people get control of their dogs and their lives. They must be stopped from keeping dogs alive by turning their behaviour around. They must be stopped from helping people like me who has had significant injuries from my reactive dog and paid vet bills for other dogs my boy has hurt. They must be stopped from showing people how to take responsibility for their out of control dogs. My dog was a menace and his behavior was becoming dangerous. I attended a seminar Ted did with Tyler and it was a life changing event for me. Because my dog is not the only one who needed some balance. I have tried all the other things to no avail. People actually have to educate themselves about what balanced training is. It is NOT dominance training. I should know. I did that and that’s what brought me to this community. My dog has learned that I am listening, that I respect his issues, I am here to help and that he has choices. So no matter what, I will continue on this path. Others can continue to myrder dogs. Because you know what? Balanced trainers DONT give up! They don’t take your money and ignore your calls. They are committed, kind and only want to help. They leave their egos somewhere else. And you know what else? My dog will get to live because I didn’t give up in him, and this community did not give up on me! Cookie anyone? What a great post. I have volunteered in Shelters and see it happen all the time. Dogs brought back and put to sleep for mouthing, something that could have been fixed in minutes. You hear about the adoptions but hardly ever hear about the returns. It’s sad and anything and everything should be done to try and help these dogs get into homes. I am tired of hearing that they are being suppressed by balanced training and that the dog lives scared, I have multiple, multiple clients that would laugh at that notion as they love and treat their dogs like family members and include them in Everything! If I had not learned how to train my dog with an ecollar goodness knows where he would have ended up….we had already gone to positive training with him and they were unable to help us. Now he is a happy, well balanced dog that is able to enjoy freedom to run and play with other dogs as all dogs should. Keep up the good work. Lack of knowledge causes people to dislike or speak negatively things they don’t understand. Share your knowledge and be blessed, Cupid Seymour of Loving Care Dog Training. 205 421 3143. Unleashed Potential training has allowed my wife and I to start a rescue and save dogs that other rescues pass up because they can’t adopt out the dogs with their issues. With what we have learned from Ted and Duke we are able to rehab these dogs and adoptt them out fully rehabilitated and trained. I have an extremely fearful German Shepard. She has a fear of strangers and other dogs. I tried many methods to try and correct my dogs behavior. It got so bad my spouse had put a kijiji ad up to try to give our dog away. (Luckily she changed her mind when the people were getting ready to pick her up). I was not able to walk my dog out of fear she would bite a person or dog. We couldn’t have company over out of embarrassment of our dogs behavior. Needless to say I had a friend why had some issues with his dog and had his dog trained by Ted at Unleashed Potential. I made an appointment and had the free consultation with Ted. About a month and a half later We started training. Yes we were apprehensive about using tools people chain are abusive, but we decided a little bit of correction while training is better then a life of being locked up for a lifetime. Within the first 2 lessons I saw a significant difference in my dog. My dog is stick improving everyday and I continue to train my dog with unleashed potential. My dog now gets out for walks. She is able to go to the vet without any issues. And we have no issues with having company over. Unleashed Potential gave my dog her life back.